The Election Commission (EC) has categorically asked all the Deputy Commissioners and SSPs to ensure that even VVIP vehicles moving along with security need to be stopped and checked if there is any suspicion or complaint about them. In a stark contrast to the cavalcade of cars and other vehicles that earlier accompanied candidates at the time of filing nomination papers, both Rakesh Pandey and Parveen Bansal, Congress and BJP nominees from the Ludhiana North Assembly segments, respectively, today created history of sorts as they chose to travel by the recently launched City Bus Service to file their papers at the Mini Secretariat. Albeit, their reasons for travelling by bus were different. The two key contestants from the Ludhiana North Assembly segment -- Rakesh Pandey and Parveen Bansal -- are almost equally placed as far as the total net worth of both of them as individuals is concerned. In a big relief to the Congress, former chairman of Housefed Punjab, Krishan Kumar Bawa, today announced that he would be supporting party candidate Malkit Singh Birmi from the Atam Nagar constituency. Following in the footsteps of mobile companies, banks will soon allow their customers to switch banks without changing their account numbers. 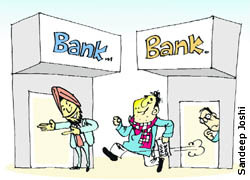 Plans to introduce bank account number portability are on the cards. The main idea behind the move is to save customers from the inconvenience of opening and closing bank accounts or keeping multiple accounts if they have to shift to a new location or if they find the services of a bank unsatisfactory. The Municipal Council, which remains in the news for its erratic functioning, sprung a new surprise when employees of the sewerage board dug up a newly constructed Raikot Road at various places. The first semester result of Class X, which was declared by the Punjab School Education Board (PSEB) yesterday, proved to be a troublesome affair for many schools in the district. The strictness of the Election Commission has already started yielding results. The candidates are not taking out big processions while going to file their nomination papers. They confess that it is only due to the strict check by the Election Commission, that they have decided to discontinue with the tradition of taking out such processions. Power supply to the Civil Hospital remained disrupted for four hours. Sources said due to the power failure, doctors had to postpone operations. The generator set available at the hospital has also been lying defunct for long. The three main candidates from the Atam Nagar constituency -- SAD candidate Hira Singh Gabria, Congress candidate Malkit Singh Birmi and Independent Simarjit Singh Bains -- would be filing their nomination papers tomorrow. The leaders say that there is no superstition behind choosing this particular date. 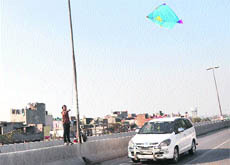 Children running after kites are endangering their lives in a bid to catch them, they scurry in the middle of busy roads and even on the flyovers. Industry representatives feel that the decision to allow FDI in retail will prove dangerous as it will affect millions of micro and small enterprises (MSEs) as well as poor and middle class consumers. The Ludhiana North Assembly segment, predominantly comprising congested old city localities, has undergone geographical transformation post delimitation with addition of about six wards while some other localities have been merged with other constituencies like Ludhiana West and Ludhiana East. The shawl industry in the city has come a long way. There was a time when everything was done by craftsmen and it took months for a masterpiece to get ready. But today, everything is done on machines. There has been a revolution in the shawl industry. Guru Angad Dev Veterinary and Animal Science University (GADVASU) has formed a new establishment, School of Public Health and Zoonoses. A training programme on bio-medical waste management was held at the Indian Medical Association House in Ludhiana today. The programme was conducted by Environment Protection Training and Research Institute (EPTRI), Hyderabad, Andhra Pradesh, in collaboration with the Punjab Pollution Control Board (PPCB) and Indian Medical Association (IMA), Ludhiana. Ludhiana: The McKinsey's research group, USA, has advocated that the focus of the 12th plan (2012-17) document is on the manufacturing sector which needs sizeable promotion of entrepreneurs. In the light of global endeavours in this regard, a three-day entrepreneurship awareness programme was organised for the students of MBA and MCA at Guru Nanak Dev Engineering College, Ludhiana. The programme is collaborated with Science and Technology Entrepreneurship Park (STEP), a concern of the Government of India. The Ludhiana (rural) police has found a body of a woman in dumped in a drain near Disposal Road, Jagraon, last evening. The victim was wearing a blue jean and black top and appeared to be 25 years of age. The body has not been identified so far. The police has taken the body in its custody and sent it for a post-mortem examination at Civil Hospital, Jagraon. “Basketball is my passion and I cannot live without it,” said Amritpal Singh, a top scorer of the Punjab basketball team, which took part in the National Basketball Championship held in Chennai, Tamil Nadu, recently.